The new trailer from Vamporama Films for Monsters. Written and directed by Chrissie Harper from an idea courtesy of yours truly, featuring Liam Woon as ‘The Man’. We’re hoping to premiere it in late November. I was over in Coventry yesterday, cooling my heels (and a lot else besides) in a massive grocery warehouse alongside my Vamporama Films colleague Chrissie Harper and actor Liam Woon. 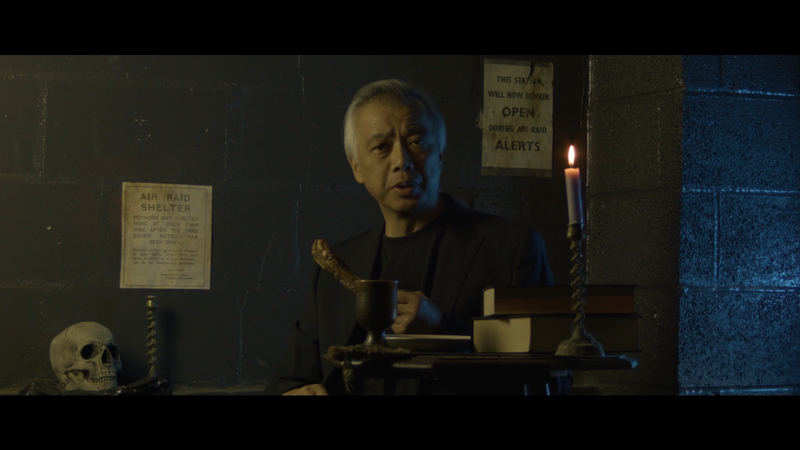 We were there for principal photography on our new horror short Monsters (the photographs above show Liam during the final rehearsal and a sample clip with preliminary grading). More news soon. 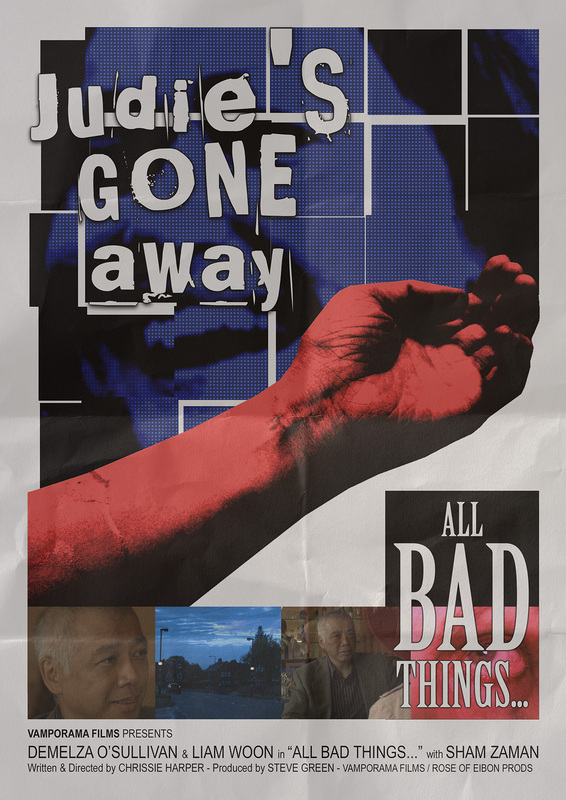 Sunday, 9:40pm: All Bad Things… will receive its first public screening. 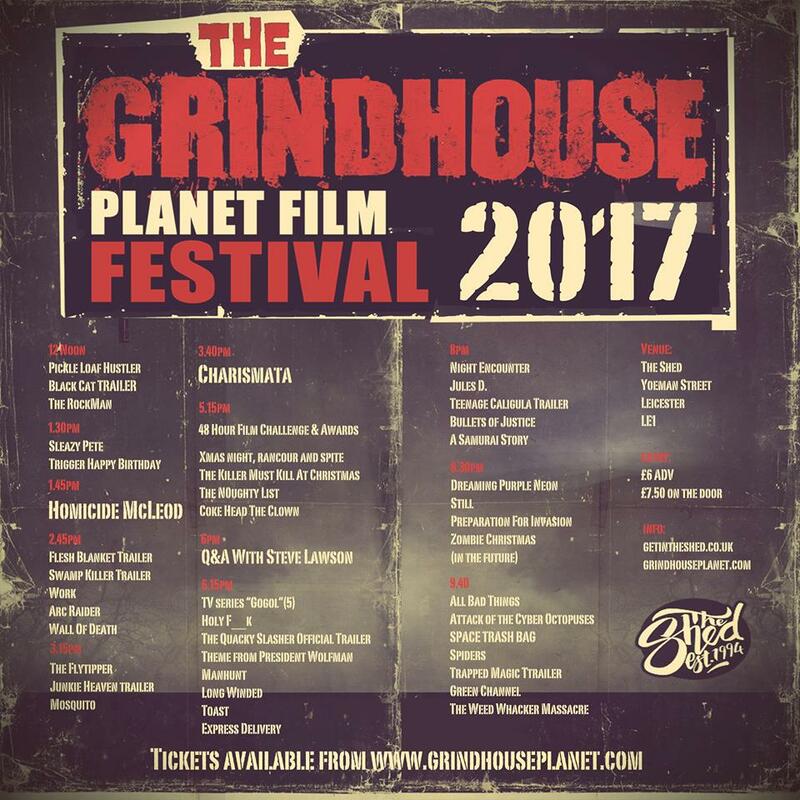 Fresh from last month’s cast and crew screening, our short fantasy All Bad Things… will receive its official premiere on 26 November, when it’s shown at the second annual Grindhouse Planet Film Festival in Leicester (out of competition, since I’m one of this year’s judges). To tie in with its maiden voyage into the festival circuit, my colleague Chrissie Harper has designed the poster below, featuring actors Liam Woon and Demelza O’Sullivan. My friend Kevin Clarke just sent over this great shot of some of the cast members who attended Sunday’s screening of All Bad Things… and the Club Vamporama shorts. Standing: Anthony Atkins, Liam Woon, Jamie Lambe. Seated: Sophie Sharp, Sham Zaman, Demelza O’Sullivan, Melyza Fay. 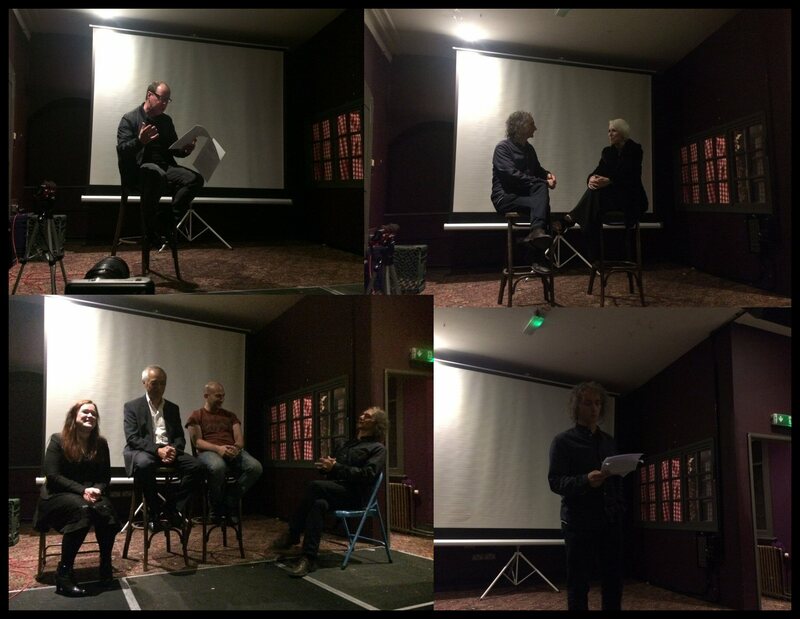 We had a great night at the Victoria public house in Birmingham’s city centre, when cast and crew were finally able to see Network 23’s inaugural short films: Who is Bette Noir? (a mock news report introducing key characters from Club Vamporama), Hail Cthulhu! (a ‘minisode’ featuring Club Vamporama regulars Jenni and Marie) and the psychodrama All Bad Things… (which actually wrapped filming on Saturday night). The event was hosted by horror author Jasper Bark and kicked off with a magnificent rendition of Edgar Allan Poe’s ‘The Tell-Tale Heart’ by local actor William Hayes. 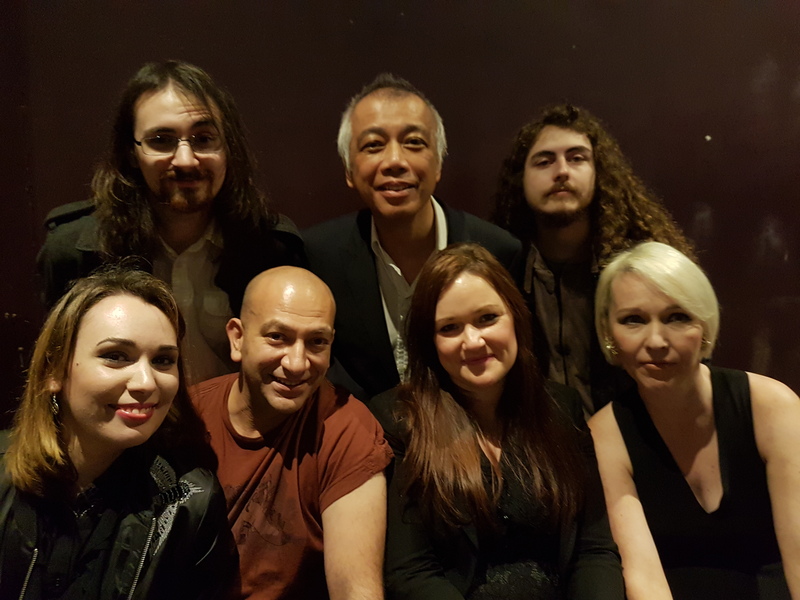 Jasper interviewed Melyza Fay about playing ‘Jude’ in Club Vamporama and her forthcoming role as ‘Elizabeth’ in the giallo tribute Terror at Bell’s End, then talked to All Bad Things… co-stars Demelza O’Sullivan (‘Alex’), Liam Woon (‘Mike’) and Sham Zaman. The programme ended with Jasper reading his own short story ‘Taking the Piss’. 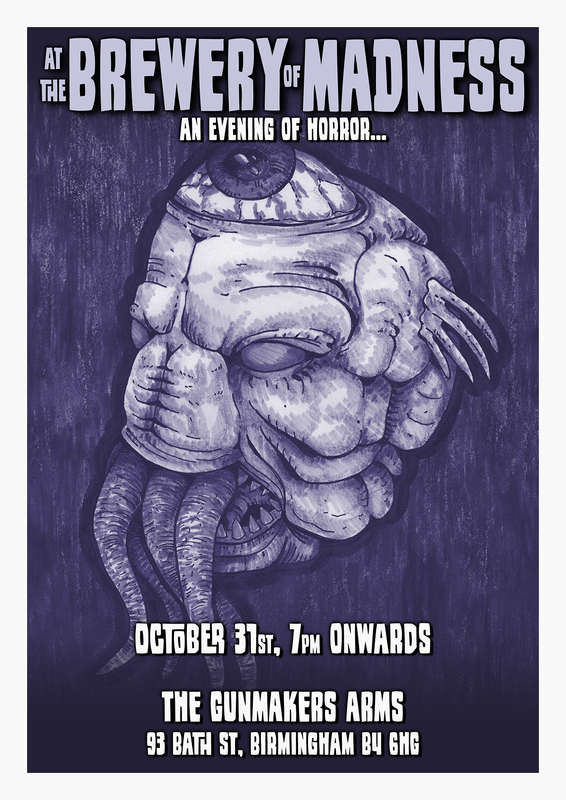 All three films will receive their public premiere at the Gunmakers Arms’ Halloween shindig At the Brewery of Madness. Above, first row: William Hayes gets his teeth into The Tell-Tale Heart; Jasper Bark talks to Melyza Fay. Above, second row: Demelza O’Sullivan, Liam Woon and Sham Zaman chat with Jasper; Jasper closes the night with some toilet humour. Below: Chrissie Harper’s poster design for the Gunmakers Arms’ event tomorrow evening. She also took these photographs. 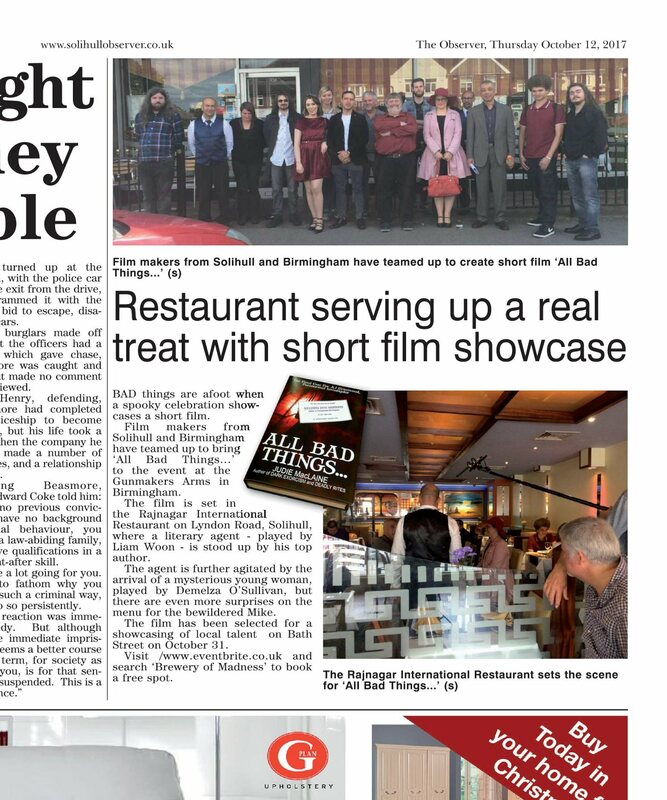 The cast and crew of All Bad Things…, photographed yesterday outside the Rajnagar International Restaurant in Solihull. Left to right: Joe Dempster, Sham Zaman, Gabriela Zogall, Anthony Atkins, Sophie Sharp, Olivia Comer, John Messer, Kevin Clarke, Steve Green, Rob Eadon, Demelza O’Sullivan, Abul Kalam, Liam Woon, Aliy Haycox, Jamie Lambe. Not shown: Chrissie Harper (back behind the camera), David Shakes, Omar Kasis. 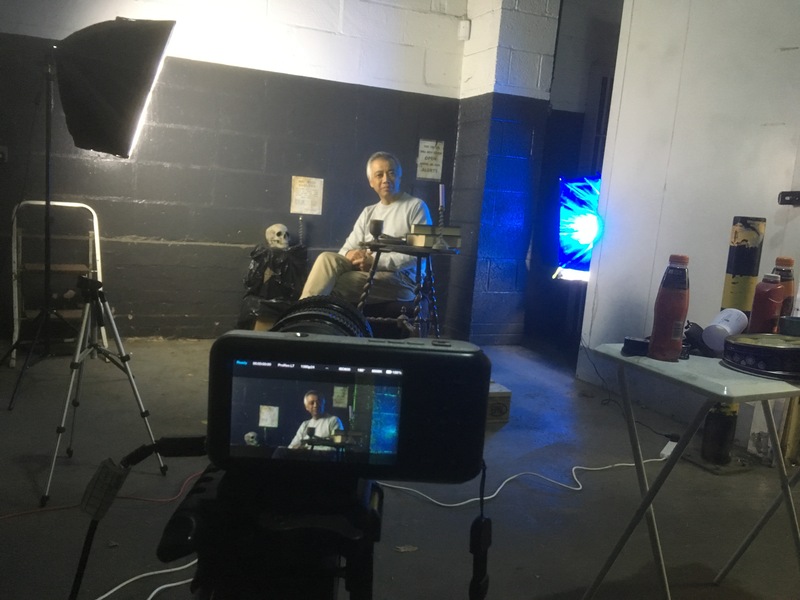 Principal photography commenced yesterday morning on All Bad Things…, a short film directed by Chrissie Harper from her own screenplay (developed from an idea of mine). 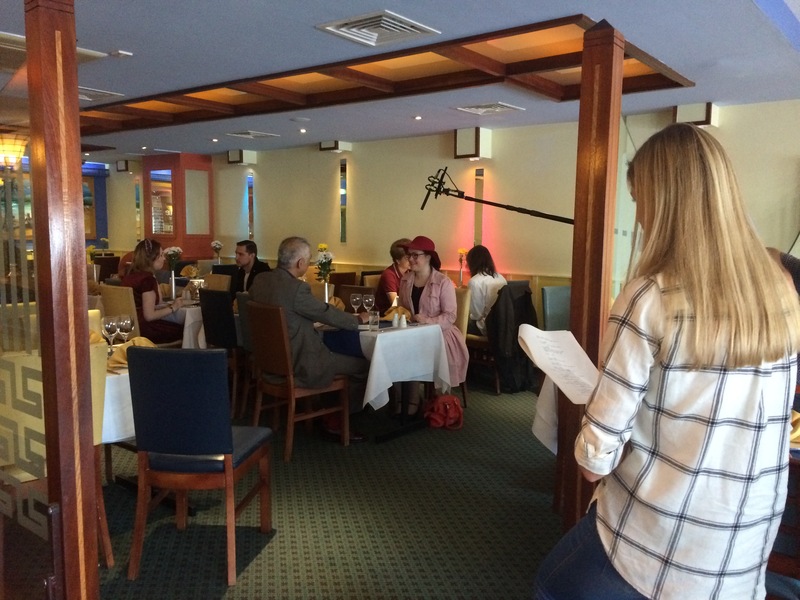 The two leads are played by Liam Woon and Demelza O’Sullivan, with Sham Ali as the waiter. 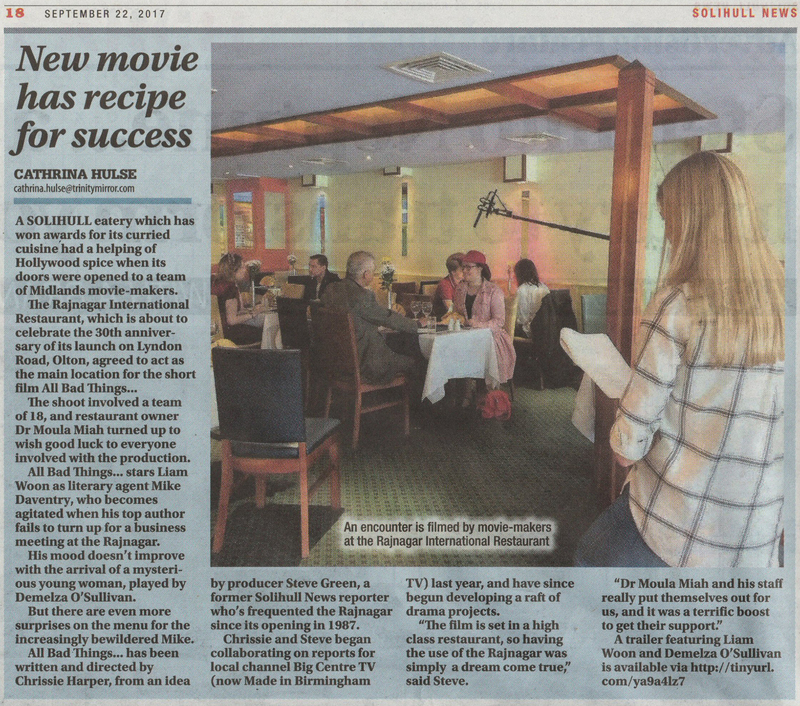 We were generously offered a chance to film at the award-winning Rajnagar International Restaurant in Solihull, which really added to the authenticity of the storyline. There are two short scenes left to shoot, but we hope to have the final edit completed by early October.